William Pratt - Dry alongside. Tidal estuary wharf. - Online gallery supplying original fine art. Trending Modern British and Contemporary Welsh. Available for sale from Big Sky Fine Art; this original oil painting by William Pratt, dating from 1908.<br> The painting is presented and supplied in a sympathetic ornate contemporary frame. The painted surfaces and canvas have benefitted from some restoration, cleaning and conservation, which took place in 2015 on our instructions. <br> <br> William Pratt was one of an accomplished group of Scottish artist who specialised in painting scenes of country life around the turn of the nineteenth century. He painted figures, marine and landscapes and was equally adept with oils or watercolour work. His work has a warmth, directness and sympathy. He captures the spirit of the subject but without being overly romantic. His subjects range from portraiture of significant figures of the day to scenes of simple rural life, often depicting the hardship of ordinary folk. <br> <br> The Scottish critic James I. Caw wrote of Pratt that he was “an accomplished artist”, who was “painting with vigour, drawing soundly and well, putting complex materials together with commendable skill and not deficient in ideas or sympathy”<br> <br> William Pratt was born in Glasgow on April 17th 1855. His parents were Arthur Pratt, a house builder, and Margaret, formerly Chisholm. He was received his formal training firstly at the Glasgow School of Art, then at the Academie Julian’s in Paris. His artistic influences were the Scottish painter Sir David Wilkie RA and the Irish artist William Mulready RA.<br> <br> He exhibited regularly from 1880, at the Royal Academy, the Royal Society of Artists, the Paris Salon, where he had an honorary mention, the Edinburgh Exhibition, winning a bronze medal in 1886, Liverpool and Munich.<br> <br> Pratt lived all his life in the Glasgow area, first at Kirkintilloch, then Hunaless, Lenzie, where he died in 1936. He enjoyed gardening and golf and was a member of the Glasgow Art Society. <br> <br> Pratt’s paintings are very much appreciated today, his work is represented in the Gallery of Modern Art in Venice, and his paintings can be found in the Glasgow Art Gallery, the City of Edinburgh collection, the National Museum in Northern Ireland and various Scottish County Councils. <br> <br> This original oil on canvas depicts a wooden sailing barge, white with a red bottom, which is in a dry wharf, alongside a wall, leeboard exposed. The tide is out and the estuary is shallow for a few hours. The sails of the vessel are folded, leaving the two masts bare. There are figures on board, attending to the various equipment. There is a small white rowing boat to the stern, also resting on the wet mud. In the background are various commercial buildings, and the brown sails of another vessel. The sky above is cloudy and grey. The overall palette is however warm and this is a well- balanced and very pleasant piece. Available for sale from Big Sky Fine Art; this original oil painting by William Pratt, dating from 1908. The painting is presented and supplied in a sympathetic ornate contemporary frame. The painted surfaces and canvas have benefitted from some restoration, cleaning and conservation, which took place in 2015 on our instructions. William Pratt was one of an accomplished group of Scottish artist who specialised in painting scenes of country life around the turn of the nineteenth century. He painted figures, marine and landscapes and was equally adept with oils or watercolour work. His work has a warmth, directness and sympathy. He captures the spirit of the subject but without being overly romantic. His subjects range from portraiture of significant figures of the day to scenes of simple rural life, often depicting the hardship of ordinary folk. William Pratt was born in Glasgow on April 17th 1855. His parents were Arthur Pratt, a house builder, and Margaret, formerly Chisholm. He was received his formal training firstly at the Glasgow School of Art, then at the Academie Julian’s in Paris. His artistic influences were the Scottish painter Sir David Wilkie RA and the Irish artist William Mulready RA. He exhibited regularly from 1880, at the Royal Academy, the Royal Society of Artists, the Paris Salon, where he had an honorary mention, the Edinburgh Exhibition, winning a bronze medal in 1886, Liverpool and Munich. Pratt lived all his life in the Glasgow area, first at Kirkintilloch, then Hunaless, Lenzie, where he died in 1936. He enjoyed gardening and golf and was a member of the Glasgow Art Society. Pratt’s paintings are very much appreciated today, his work is represented in the Gallery of Modern Art in Venice, and his paintings can be found in the Glasgow Art Gallery, the City of Edinburgh collection, the National Museum in Northern Ireland and various Scottish County Councils. 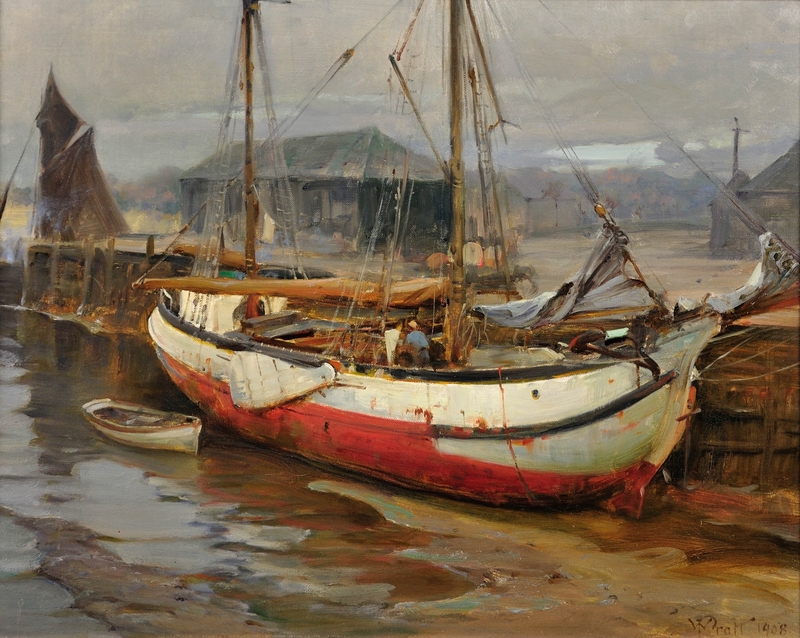 This original oil on canvas depicts a wooden sailing barge, white with a red bottom, which is in a dry wharf, alongside a wall, leeboard exposed. The tide is out and the estuary is shallow for a few hours. The sails of the vessel are folded, leaving the two masts bare. There are figures on board, attending to the various equipment. There is a small white rowing boat to the stern, also resting on the wet mud. In the background are various commercial buildings, and the brown sails of another vessel. The sky above is cloudy and grey. The overall palette is however warm and this is a well- balanced and very pleasant piece.